My best and most popular recipe for Chili Con Carne. Enjoy! On a cold winter day one of my favorite dishes is a well-made, spicy and tasteful Chili Con Carne. I have now, for a long time, wanted to come up with my own favorite recipe for a Chili Con Carne. After several testing and talking with people – where some of them are professional chefs – I believe that the recipe I have listed below is the world’s best Chili Con Carne. If you are a regular reader of my blog or some of my social media, you would know that my preferred recipes are the ones that are very easy to make and also healthy. Of course, it is nice cook some advanced and super delicious good in the weekends. However, the fact is that we all normally work five out of the seven week days. Therefore, we are often late home and the need for easy and healthy food is very important. For me unhealthy fast food and take-away is a no-go especially if it starts to be on a regular basis. Simple recipes which are easy-to-cook and healthy at the same time is just the best. I love them! I am always on the lookout for this type of recipes, so please, if you can recommend any I would love to hear from you in the comment section below. Fortunately, a Chili Con Carne is both very easy to make, super delicious and also healthy. I always uses lean ground beef and together the kidney beans this dish is a great source of protein and dietary fiber. When I started investigating and looking into recipes of this world famous dish, I discovered that there are probably more than a hundred thousand different ways of making this dish. I tried to write down all the findings from the many different sources and to stick together all the parts. I always try to ‘develop’ my own personal recipes from other recipes and I always never just uses a recipe as it is. Normally I changes a few things so that it fits my personal preferences. When I work in my kitchen and especially when I am ‘developing’ recipes, I always keep in mind that the dish should be an ‘every-day-dish’ and therefore should be easy to make. This was also important for me when I made this chili con Carne – and I think it worked out really good. From start to finish, this recipe only takes about 30-40 minutes to make and the best thing is that it only requires about 15 minutes of work. The rest of the time you can clean up, set the table or maybe even better, simply just talk and hangout with you family. All these things, I have mentioned above, is probably why I like this dish so much. I typically serve this dish together with white or brown rice, tortilla chips or sometimes simply just alone. It is perfect in all ways. In a large saucepan; heat up the vegetable oil and fry the coriander powder, cumin powder, chili flakes and the finely chopped red chili. Fry for a couple of minutes. Add the finely chopped onions and fry for another couple of minutes or until the onions are translucent. Add the ground beef and cook until the beef is done. Add the chopped tomatoes and the beef stock. Let everything simmer for about 30 minutes. 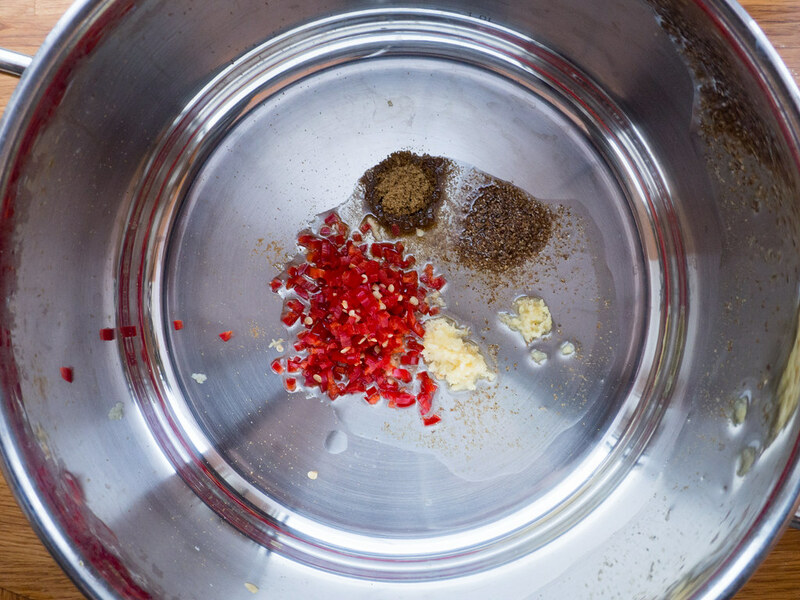 ‎If you prefer you can add some extra chili powder to taste. Add the drained kidney beans and let them slowly heat up for about 5 minutes. ‎Remove the saucepan from the stove; add the dark chocolate and gently stir and mix everything. Continue until all the chocolate is melted and mixed with the sauce. ‎Serve the Chili Con Carne with rice or tortilla chips. If you have made a hot sauce, you can with advantage use some sour cream to ease the hotness a little.